Dubai, United Arab Emirates | November 10, 2018 – Today marks the opening of the much-anticipated Jameel Arts Centre, an innovative cultural destination developed by Art Jameel, the independent organisation that supports arts, education and heritage in the Middle East. Designed as a 10,000-square-metre, three-storey, multi-disciplinary space by UK-based Serie Architects, Jameel Arts Centre is the first non-governmental contemporary arts institution of its kind in the Gulf. The Centre, which was officially inaugurated on November 8, 2018 by His Highness Sheikh Maktoum bin Mohammed bin Rashid Al Maktoum, Deputy Ruler of the Emirate of Dubai, opens to the public tomorrow, November 11, with an opening week of programming designed for all ages. Reflecting the institution’s commitment to dynamic programming that resonates with a diverse audience, Jameel Arts Centre launches with a broad-ranging lineup of exhibitions, commissions and events. Spread across five galleries, the inaugural group exhibition, ‘Crude’, curated by Murtaza Vali, considers the complex theme of oil within both historic and contemporary contexts. Artist’s Rooms, an on-going collaborative series of exhibitions that focus on a single artist represented in the Art Jameel Collection, opens with a series of four solo shows by eminent artists from the Middle East and Asia: Maha Malluh, Lala Rukh, Chiharu Shiota and Mounira Al Solh. A selection of large-scale installations and sculptural works, several newly commissioned, are on view aon the Centre’s roof terrace and within a series of permanent gardens designed by landscape architect Anouk Vogel. Gallery 9 focusses on artist’s film and video, starting with a work by Jumana Manna. Jameel Arts Centre is a venue for ongoing research, education and programming. Jameel Library, the UAE’s first open-access contemporary arts library and resource centre, opens with a bilingual collection of nearly 3,000 books, journals, catalogues and theses. Knowledge-generating Library programmes will include talks, research projects, symposia and reading groups. The Youth Assembly, a pioneering peer-to-peer programme serving and led by the next generation of creatives, opens its Inaugural session from November 2018 through April 2019. The initiative will lead to the production of art, design, research, interventions and public events specifically geared towards youth aged 18-25. The Centre’s opening also marks the launch of Jaddaf Waterfront Sculpture Park, Dubai’s first open-air art park, crafted by UAE-based ibda design and developed by Dubai Holding. The initial installation includes sculptures by Helaine Blumenfeld, Talin Hazbar and Latifa Saeed, Mohammed Ahmed Ibrahim, David Nash and Slavs and Tatars. A series of public events and activations curated by Art Jameel for the park kicks off with the Middle Eastern/Asian premiere of WATERLICHT, an immersive light installation by renowned Dutch artist and innovator Daan Roosegaarde, presented by Dubai Holding. Rather than presenting a static display of a permanent selection of works, works will be drawn from the Art Jameel Collection for curated exhibitions at the Centre, complemented by works on loan and new commissions. The Jameel Arts Centre will also present co-curated and touring exhibitions developed through Art Jameel’s long-term partnerships with international institutions. Further details about the next six months of staggered exhibitions, including new works and solo installations by artists such as Hemali Bhuta, Hassan Khan, Seher Shah, Randhir Singh and Farah Al Qasimi, will be shared in the coming months. ‘Crude’ brings together 17 artists and collectives from the region and beyond to explore oil as an agent of social, cultural and economic transformation, as well as a driver of geo-political upheaval. Developed by Sharjah- and New York-based curator Murtaza Vali, ‘Crude’ considers some of the complex histories of oil as a catalyst of modernity across the Middle East, tracing its effects through the archives, infrastructures, and technologies it has produced. The exhibition showcases works by contemporary artists including: Latif Al Ani, Manal AlDowayan, Alessandro Balteo-Yazbeck, Media Farzin, GCC (Khalid Al Gharaballi, Nanu Al-Hamad, Abdullah Al-Mutairi, Fatima Al Qadiri, Aziz Al Qatimi, Barrak Alzaid, Amal Khalaf), Raja’a Khalid, Lydia Ourahmane, Houshang Pezeshknia, Monira Al Qadiri, Hassan Sharif, Wael Shawky, Nasrin Tabatabai and Babak Afrassiabi, Rayyane Tabet, Hajra Waheed, Michael John Whelan, Lantian Xie and Ala Younis. Works from the 1950s and 1960s are juxtaposed with more recent works, including several new commissions. ‘Crude’ is accompanied by a specially produced catalogue and a series of educational programmes, including a film series and a symposium in Spring 2019. 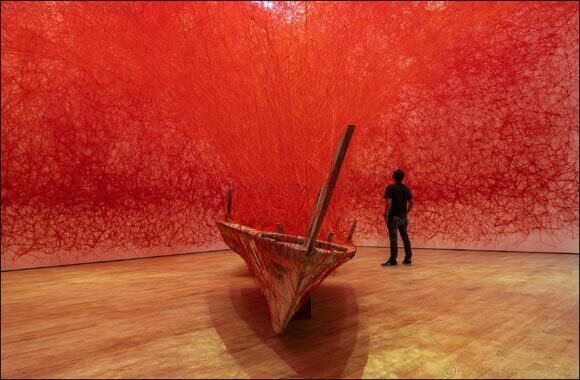 Marking Art Jameel’s long-standing interest in furthering cultural links between the Gulf and Japan, artist Chiharu Shiota has been commissioned to create a site-specific installation for her Artist’s Room. Working with large quantities of yarn, Shiota creates immersive web-like structures that take over entire rooms; for this significant, new piece she was inspired by the Dubai’s historic and contemporary identity as a port city, a place of trade and confluence, and the site of Jameel Arts Centre on the Jaddaf waterfront. Saudi Arabia’s best-known female artist Maha Malluh is greatly influenced by her spiritual connection to the historic region of Najd, Saudi Arabia. This first solo presentation of the artist’s work in the UAE features large-scale sculptural installations comprised of everyday, domestic materials. An influential artist, teacher and women’s rights activist in Pakistan, the late Lala Rukh’s (1948-2017) practice often explored the structures and notations of classical music from South Asia. Bringing together work from the Art Jameel Collection and loans from partner institutions, Lala Rukh’s Artist’s Room supplements the last work she produced, the video Rupak (2016) – which debuted at Documenta 14 and will be shown for the first time in the Middle East – with older works on paper, revealing her long-standing interest in rhythm, memory and the body. The video and textile works presented in Lebanese artist Mounira Al Solh’s Artist’s Room are typically sharp, humorous and wry. Bringing together major currents in her practice, the works deal with the violent and sometimes absurd force of political events on personal lives, as well as her ongoing interest in the form and function of language. A series of film programming launches with Wild Relatives (2018) by Jumana Manna. This feature-length film furthers Manna’s ongoing exploration of how taxonomies of seeds, and plants carry histories of violence and colonialism. The film charts the transaction of seeds between two very-distant, semi-desert geographies in Norway and Lebanon, which became entangled with one another when the Svalbard Global Seed Vault, a backup facility for thousands of crop gene banks located across the world, was asked to make a withdrawal to ensure the continued cultivation of crops native to Syria. In addition to gallery-based exhibitions, Jameel Arts Centre features major installations by local and international artists that interact with the building itself: the lobby features a new, interactive work by Lara Favaretto, and Shaikha Al Mazrou presents the first in an annual series of commissioned projects for the Artist’s Garden. The playfulness of Favaretto’s kinetic repurposed industrial car wash brush sculpture belies a charged commentary on modern life, while Al Mazrou has opted to create a sculptural sectioned glass house for this experimental, light-filled, creekside outdoor space, commenting on sustainability and agriculture with a minimalist gesture. A sculptural work by Vikram Divecha will also be installed within the garden spaces in the coming months. The winning work from the first edition of Art Jameel Commissions will be revealed on the Roof Terrace during the Centre’s opening, and will remain on view through September 2019. Contrary Life: A Botanical Light Garden Devoted to Trees (2018) by Kuwait-based artists Alia Farid and Aseel AlYaqoub riffs on our relationship with the natural and nocturnal worlds; their site-specific installation acts as a community botanical garden, albeit one made up of artificial, hybrid trees and flora created with artificial lights. An annual programme in a three-year cycle, Art Jameel Commissions is foundational to the programming of Jameel Arts Centre. An open call for proposals to Art Jameel Commissions: Arts Writing and Research runs until December 1, 2018. The third Art Jameel Commissions, focusing on drawing and painting, will be announced in 2019. Jameel Library, an open-access research centre, features a bilingual collection of nearly 3,000 books, journals, catalogues and theses, materials in part collaboratively crowd-sourced from Art Jameel’s extensive network of academic and cultural organisations. Free and open to all, the library will be the site of knowledge-generating programmes including talks, research projects, symposia and reading groups, intended for a wide ranging audience of students, artists, researchers, writers, professionals and ‘the curious’. With an Online Public Access Catalog (OPAC) that can be searched entirely online, Jameel Library is designed for both a local and global audience. The opening of Jameel Arts Centre marks the launch of Jaddaf Waterfront Sculpture Park, the first open-air art and sculpture park located in the heart of Dubai. Created by the award-winning, UAE-based architecture studio ibda design, the park serves as a bridge between the public corniche circling Jaddaf Waterfront and the new Jameel Arts Centre. Inaugural sculptures include works by Helaine Blumenfeld, Talin Hazbar and Latifa Saeed, Mohammed Ahmed Ibrahim, David Nash, and Slavs and Tatars. A series of public events and activations curated by Art Jameel for the park launches with the regional premiere of WATERLICHT (2018), an immersive light installation created by Dutch artist and innovator Daan Roosegaarde. WATERLICHT will be staged three times during Jameel Arts Centre’s opening week and is free and open to the public (advance registration advised). Embedded in the architecture and designed by landscape architect Anouk Vogel, Jameel Arts Centre’s seven garden installations reflect local and global desert biomes. The gardens feature a collection of sculptural plants native to the world’s deserts, while striking vegetal textures, subtle mineral hues and unusual paving provide each garden with a unique character. Dedicated public and educational events have been developed for all ages, including an active schools’ programme which aims to engage young visitors from across the UAE with ongoing arts education. The first regional Youth Assembly for the arts, run by 18 to 24-year-olds, gives a diverse group of nine young artists, writers, architects, creative designers, animators, social entrepreneurs and coders the opportunity to design events specifically for their generation. A pioneering peer-to-peer initiative designed to foster creative leaders, the Art Jameel Youth Assembly is the cornerstone for the Centre’s programming dedicated to this key age group. Future programming will continue the organisation’s commitment to attract and serve a wide range of local communities and global visitors. Highlights of the coming Spring 2019 programme include a new sound installation by artist, writer and curator Hassan Khan in the sculpture park; a symposium and film series expanding on themes addressed in ‘Crude’; and new Artist’s Rooms solo shows featuring Hemali Bhuta, Seher Shah and Randhir Singh and Farah Al Qasimi. The symposium and book launch Past Disquiet – exploring histories of trans-national and anti-imperial solidarity within the arts and museums in the 60s and 70s – will take place in January 2019.